Marcus is a 2nd year student in the Business Technology Management program here at Ryerson. This will be Marcus’ second year on the Ryerson Orientation Crew and 3rd time attending Orientation (once as a new student and twice as a leader). 1. What positions have you held on the Ryerson Orientation Crew? So far I have only participated as a group leader. 2. Did you go to your own Orientation in your first year here at Ryerson? I went to every single event during my year. I was coming into Ryerson not knowing too many people so I saw O-Week as the perfect opportunity to meet new people. 3. If you could describe Ryerson Orientation in 3 words what would they be? Memorable, because there is so much going on, you end up doing a lot of interesting things that always come up later on. Exhausting, I always enjoyed getting a chance to relax at the end of each day, and by the end of the week I’m ready to do absolutely nothing for the weekend that follows. The whole experience is worth it though. Fun, no matter what we were doing, whether the weather was good or not, everyone was always having a good time. 4. Describe the Ryerson Orientation Crew in 3 words? Dedicated, some people don’t know that ROCs volunteer their time to be there throughout week, as well as training beforehand. None of us are asked to volunteer either, it is something that we all just enjoy doing. Energetic, each ROC made sure they brought the energy and enthusiasm out every day to ensure that O-Week was a good week. Accepting, throughout the week we end up meeting many different people and the ROCs welcomed every single one of them without discrimination. 5. What do you find most rewarding about volunteering with the Ryerson Orientation Crew? I found that during my time as a first-year experiencing O-Week for the first time, and as a leader, there comes a point where leaders kind of stop being leaders in a way because everyone has started to get more comfortable being around each other, and it becomes a more natural environment due to the bonds we forged during that week. At that point you know that there is always going to be someone there for them at school should you need help with any problems or just want to hangout. To be able to help ease people into a new chapter of their lives is definitely the most rewarding thing about volunteering for me. 6. What is your favourite moment from past Orientations? It is hard to choose one moment as my favourite, especially since I have experience it twice, as a leader and as a incoming student. The Welcome Gala was cool for me though because that wasn’t part of O-Week during my year, so as a leader is a cool new first time experience. 7. What’s the one event that students should not miss? The hypnotist show with Boris is definitely the one you shouldn’t miss. Everyone always enjoys it, whether they’re in the audience or volunteer to participate in the show. 8. If there were a current student that was interested but unsure about volunteering, how would you pitch the experience to them? I would tell them that O-Week is going to be one the best weeks they’ve ever had. The atmosphere is great, you meet great people, and it is a fun way to end the summer before school starts. There are different ROC positions that may suit you personally or there could be something you would want to try out something that is outside of your lane. It is an open, friendly, welcoming environment so it would be extremely difficult to not have a good time. 9. What skills have you gained specifically from volunteering in Orientation? Being a ROC has helped me manage the many different personalities I’ve come across. We end up meeting so many different people, and it helps you realize you can’t approach everyone the same way, such as needing to maybe spend a few more minutes talking to a quieter person in the group so that they don’t feel forgotten. 10. 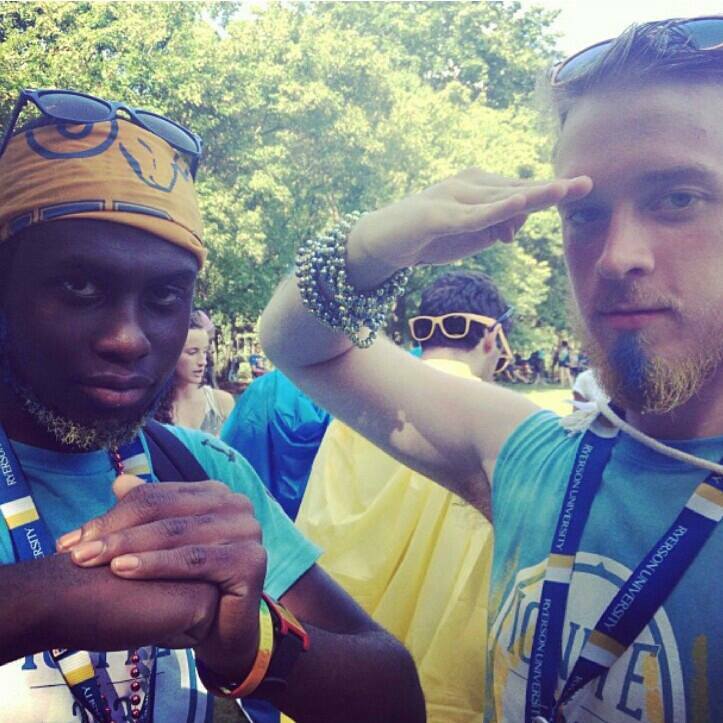 This year you have applied to be a member of the Ryerson Orientation Crew, which position did you apply for and why? I applied to be a group leader again for this year. I find it to be the most rewarding position for me because I get to interact with the incoming students on a more personal level and hopefully I am able to help them get ready for what’s to come at Ryerson.